Members of CWA Local 3010 in Puerto Rico rallied outside of the 911 Government Facility in San Juan to demand an end to the diversion of 911 funds and the austerity measures that have reduced their pay and benefits for the past few years. Since 2014, 911 employees including members of the local have seen their pay frozen and their benefits reduced. Now an exodus of 911 dispatchers threatens the security of the public. "Since 2014, the government of Puerto Rico has diverted 911 funds to use them for non-emergency-related expenses. This is not only highly illegal, but has also created a crisis in the dispatching service. We have the funds, we have the resources, but the government has decided not to invest in their 911," said CWA Local 3010 Executive Vice President Aramis Cruz. "The average handling time of our emergency calls has doubled since last year and we don't have the resources where we need them. We will keep fighting and will take the fights to the streets and to court to stop the diversion of funds." 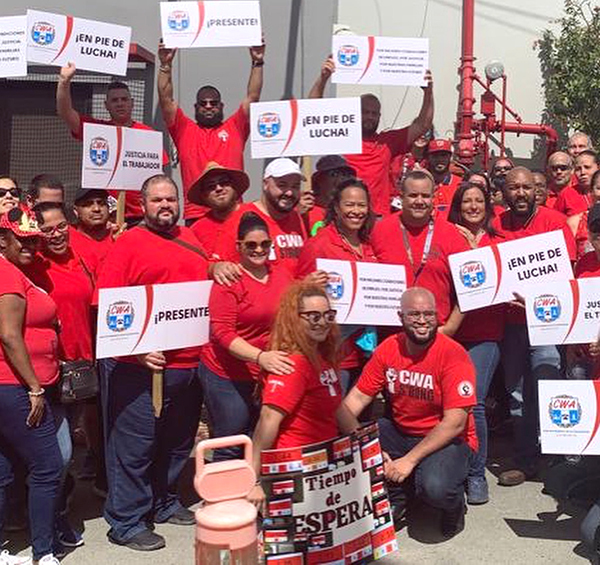 Members of CWA Local 3010 in Puerto Rico rallied outside of the 911 Government Facility in San Juan to demand an end to the diversion of 911 funds and the austerity measures that have reduced their pay and benefits for the past few years.